The purpose of the Hayle Film Club is to offer a community cinema experience for townspeople and visitors as an alternative entertainment option that is also accessible and reasonably priced. The programme comprises a mix of recent well-received films of various genres, including British, independent, some interesting mainstream, and foreign-language titles, to appeal to an audience of all ages (although all films will not always be suitable for a general audience). Some of the films will have had scant exposure in West Cornwall’s local cinemas. Membership is £7.50 a year. This is not compulsory – non-members can turn up and buy a ticket and all are welcome. However, we do encourage membership as this helps to cover extra costs. 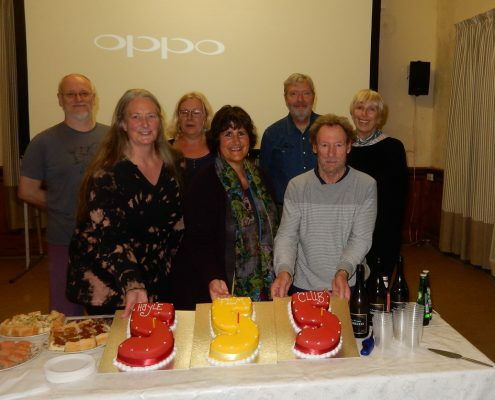 In October 2017 we celebrated our fifth anniversary, serving birthday cake, nibbles, prosecco and fizz to almost 40 members and general attendees, just before presenting the Japanese family drama After the Storm. Since our inception (potted history below), we have now screened 91 films over five years at the Passmore Edwards Institute. 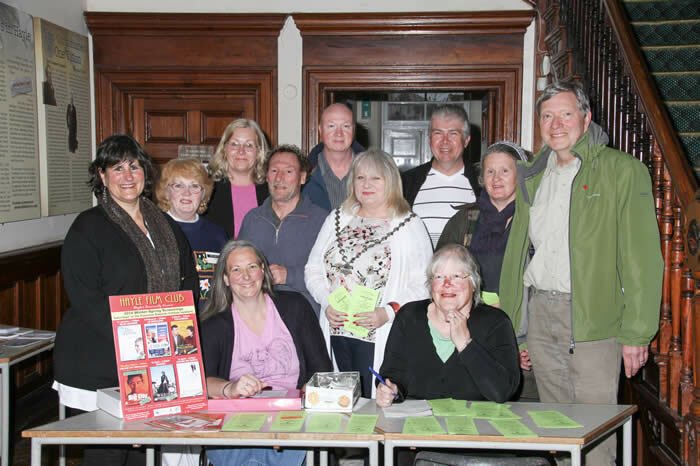 Hayle Film Club was organised by a group of enthusiastic volunteers over the winter of 2011-12. We ran two trial screenings, Woody Allen’s Midnight in Paris and Terence Davies’s The Deep Blue Sea, both of which were well attended. A pledge of seed funding from Hayle Town Council with additional support from Carn to Cove allowed us to plan a first full season of monthly screenings, beginning in September 2012. The first full season was a great success, with audience numbers increasing monthly. The final three screenings completely sold out. In April 2013 the Hayle Film Club was awarded a £2,000 grant from the Co-operative Membership Community Fund to put towards the purchase of projection equipment, formerly hired each month from Carn to Cove. 11 July 2013 — Presentation of the £2,000 Co-op Membership Community Fund grant to Hayle Film Club: (l-r) John Bennett, Cathy Bryon-Edmond, John Jansen, Hayle Co-op store manager Paul Westaway, Donna Anton (chair), Jeff Turk. 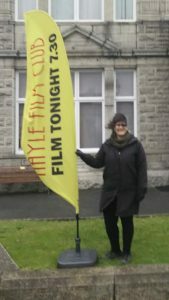 In addition, new blackout curtains, sewn by committee member Joy Scott-Mance and sponsored with an additional £150 grant from Hayle Town Council, allowed matinee screenings to be scheduled as well as to continue through the spring and summer months. In October 2013 we received our first grant, for £379, from the Cornwall Council Community Chest Grant Scheme, thanks to Cllr John Pollard, to cover the cost of a projector ceiling mount and a spare projector bulb, followed by a second grant, for £214, in February 2015 to buy two new tea urns and an audio equaliser. Even more exciting was the award of 50 ‘comfy’ new chairs — desperately needed — from the British Film Institute’s Neighbourhood Cinema Equipment Fund, which were first used for the screening of GONE GIRL in February 2015. The Passmore Edwards Institute kindly bought 20 additional chairs, which meant most of our audience could sit in comfort for the foreseeable future. 14 February 2015 — FIFTY SHADES OF GRATITUDE! 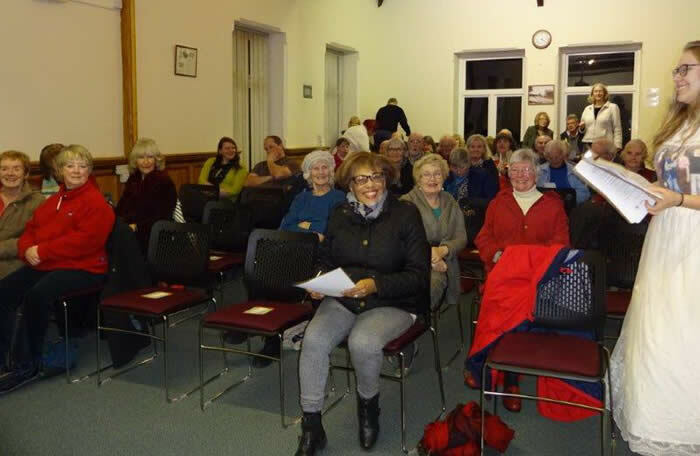 Hayle Film Club attendees, including local jazz singer Kris Gayle (front and centre), smiled as they seated themselves on the 50 ‘comfy’ new chairs awarded by the BFI’s Neighbourhood Cinema Equipment Fund, just before the full-house screening of GONE GIRL. 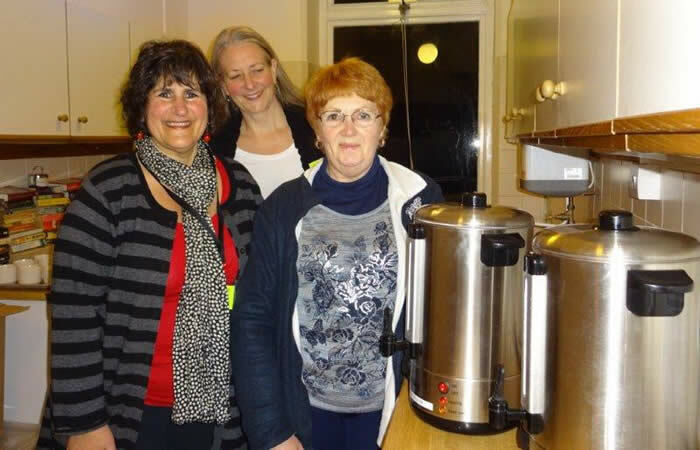 Two new tea urns, funded with a small grant from the Cornwall Council Community Chest, will make apres-screening tea and coffee service a breeze. Above (l-r): Donna Anton, chair; Candida Frith-Macdonald, secretary; Joy Scott-Mance, refreshments. Later in the year a second award from the Neighbourhood Cinema Fund expanded our chairs to a full complement of 80, and a third award, in December 2015, included a new pair of speakers, an equipment cabinet and a backup Blu-ray player.